Details about Let's Ride Corral Club a chance to own and care for the horse of your dreams! Let's Ride Corral Club a chance to own and care for the horse of your dreams! 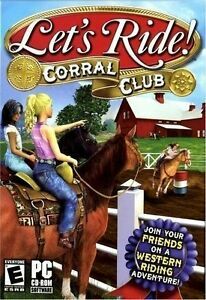 In this sequel to the 1999 title Let's Ride, Let's Ride: Corral Club once again invites players to breed their own horse and train it for competitions. Players choose their horse from among 12 breeds, give the horse a name, and customize their coat, mane, and saddle. Players can also create their own character by choosing her clothes, boots, hair color, and hat. Once sufficiently trained in galloping, trotting, cantering, and racing, the horse can compete in local events in hopes of making it to the National Championship. Player's accomplishments, such as ribbons and high scores, are saved in the "Scrapbook" and can be printed out to be shared with friends and family. Wouldn't pay more than $5! I would have never bought this game if I had played Silver Buckle Stables first. This game was way too easy and I beat it in a half hour. All you do is barrel race, nothing else. There's only four locations you can go: the stables (which you only see of it is a stall), the pasture, the practice corral and the competition. 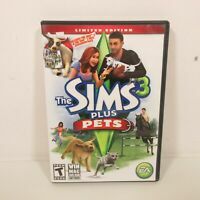 I originally bought this game for $20 but I wouldn't pay any more than $5 for it! I bought this for my 8 year old daughter who loves horses and loves to play horse games on the computer. Although she liked this game, she really wanted more adventure and rodeo. 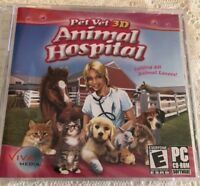 This game is good but only includes showing,trials, and caring for the horses. My daughter liked to play but there wasn't enough challenge for her. Good game for a Child. This is an awesome game for a child to play and to learn control use on the computer. It's a good game.